Glad to meet you! I’m Ernie the attorney. Here, take a card. What kind of cases do I handle? Mostly personal injury. I’m constantly suing hospitals, doctors, insurance companies, and sometimes – city agencies. None of my clients are rich, so I take my cases on contingency. What does that mean, exactly? It means that you don’t have to lay out any money. And if I win the case, I get one-third of the pay-off. So let me set you straight: I ain’t no Robin Hood. Yeah, I do take from the rich and give to the poor, but I’m really in this just for myself. And let me level with you: I make out OK. In fact, more than OK. I wanna tell you about one of my cases. In fact, this was one of the strangest cases I ever came across – and believe me, I’ve seen pretty much everything. There were these two brothers – Donnie and Frankie Johnson – one crazier than the other. They were in their early forties, and were almost inseparable. In Kuwait during Operation Desert Storm, they spent weeks putting out fires in the oil fields while inhaling a lot of smoke. The VA wouldn’t help them and Social Security turned them down for disability. And now they were homeless. You’ll never guess where these guys lived. Are yuh ready for this? They lived in a subway tunnel. Twenty-four hours a day trains would go right by them. It turns out that both of them were nearly deaf, probably from all that noise. So one day, they turned up at my office. My secretary, Gladys – she was holding her nose when she ushered them in. I happen to have a terrible sense of smell – which, frankly, can be an asset in my kind of business – so I didn’t even notice anything. Donnie handed me an eviction notice obtained by the Metropolitan Transit Authority, which owns and operates the New York City subway system. It took me only a minute to spot the good news and the bad news. The good news was that the idiot lawyer for the Transit Authority had filed the wrong case in the wrong court. The bad news was that since there would be no monetary settlement, I couldn’t make any money. But these poor guys were homeless veterans. I just felt so bad for them that I decided to handle their case pro bono. They were so happy, they came over and hugged me. Now I ain’t no constitutional lawyer, but I’ve been around the block a couple of times. Besides, it was just common sense that you can’t be evicted from a home if where you live is not a home. And I also knew that the MTA didn’t want this case to go to trial for two main reasons. 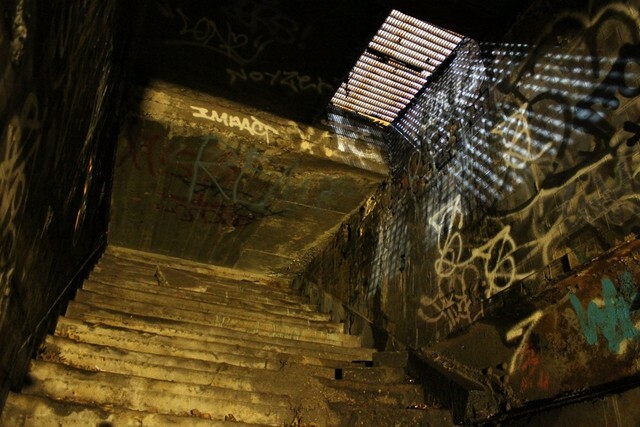 First, they didn’t want anyone to know that there were actually people living in the subway tunnels. And second, they probably realized by now that they had no case. And sure enough, the MTA quickly agreed to a settlement that satisfied both sides. The brothers could stay put, and both were given free metro cards for life. And what was in it for me? The biggest payoff I would get in my entire career. About six months later I got a call from Roosevelt Hospital. Donnie and Frankie had both been hit by a subway train. They had sustained very serious injuries — but were expected to recover. Could I come to see them? I felt really guilty. I had never even said anything to them about not going back to live in the subway tunnel. But what were their alternatives? And would they have even listened to me? On my way to the hospital, my brain was already working overtime on the case that I would be presenting to the jury. Dollar signs danced before my eyes. Still, I began to feel a little ashamed. I mean, look: these guys almost died – and all I could think about was money. When I got to the hospital, I was directed to a small private room on the eighth floor. Thankfully, they were not in intensive care. I peeked into their room and saw Frankie lying on his back, fast asleep. His elevated leg was in an ankle to thigh cast. Donnie was sitting up, but he looked kind of out of it. There was a bandage wrapped around his head just above his eyes, and his arm was in a sling. I slipped into the room and looked at their charts and began taking notes on their injuries. None appeared to be life threatening, but the Johnson brothers would certainly need to spend a few months in rehab. But then what? When I came back the next day, the brothers were both awake and very happy to see me. “Can we sue?” asked Frankie. “How much will we get?” asked Donnie. As soon as the jury ended their deliberations and entered the courtroom, I knew that we had won – and that we had won big. A few of them were even smiling. But when the judge read the amount of the award, even I was shocked. It was $12 million. My share was one-third of that — $4 million. The brothers were overjoyed. They high-fived each other, high-fived me, and even managed to high-five the bailiff. If I hadn’t restrained them, they would have high-fived the jury, and maybe even the judge. I received still another shock the next day when I learned that the MTA would not appeal the amount of the award. I guess they really wanted this case to disappear. But I had a sneaking suspicion that just maybe it wasn’t over yet. What would the brothers do with all this money? I’ve had plenty of clients who ran through settlements of hundreds of thousands of dollars in just months. But before we worried about their long-term financial security, they needed to decide what they would be doing in the immediate future. I proposed setting up checking accounts for each of them and renting a small apartment. That was fine with them. I sent them to talk an estate lawyer who would figure out what to do with their money, and to draw up their wills. Dara and I had remained casual friends since law school, but unlike me, she was completely ethical. Despite my pretty obvious curiosity, she never disclosed any of the details of their wills. From time to time I dropped by their apartment, but they either weren’t home, or maybe didn’t hear the bell. Perhaps they had both gone completely deaf. After a while, I began to lose interest. If they needed to see me, they knew where to find me. Almost a year later, Gladys dropped a copy of the Daily News on my desk, and then walked out of my office without a word. I glanced at the headline on page 3: Tunnel Dwellers Killed by Train. Gladys returned with a glass of water and a box of tissues. The next day I got a call from a lawyer with the MTA. He wanted to know if he and a couple of other lawyers could meet with me. A day later they came over to my office, and we sat around my small conference table. They asked if I would consider a settlement offer. I knew exactly why they were so reluctant to go to trial. It was so obvious, no one needed to say anything. But I’ll say it anyway: The longer this dragged on, the worse it would look for the MTA. They looked at each other and then nodded. “Good! Then I think we understand each other. Now here’s what I want you to say to them. I will be very happy to hear their settlement offer. I completely understand why the MTA would like all this behind them. The next day the MTA proposed a $20 million settlement. I grabbed it! It was even more than I had hoped for. I called Dara with the good news. We decided to go out for drinks after work. Now she was talking my language! But what was she going to tell me? Maybe that the Donnie and Frankie had left me all their money? I didn’t say anything. Dara tried reading my expression — and then tried to offer a few words of consolation. But I cut her off. “No! You don’t understand! Sure, I was hoping they left me some of their money – or even all of it. On the other hand, I already have much more money than I’ll ever spend. Despite having written fifteen math and economics books, and a whole bunch of short stories, Steve Slavin is best known for once having been Bernie Sanders’ college roommate. Google “Steve Slavin” “Bernie Sanders”. Excellent story! Monte and I really enjoyed reading it. I’d call it faction since you hit on so many significant problems in our society.